Sugar was the main crop produced on plantations throughout the Caribbean in the 18th, 19th, and 20th centuries. Most islands were covered with sugar cane fields, and mills for refining it. The main source of labor, until the abolition of chattel slavery, was enslaved Africans. After the abolition of slavery, indentured laborers from India, China, and Java migrated to the Caribbean to mostly work on the sugar plantations. These plantations produced 80 to 90 percent of the sugar consumed in Western Europe. The Portuguese introduced sugar plantations in the 1550’s off the coast of their Brazilian settlement colony, located on the island Sao Vincente. As the Portuguese and Spanish maintained a strong colonial presence in the Caribbean, the Iberian Peninsula amassed tremendous wealth from the cultivation of this cash crop. Other imperial states observed the economic boom catalyzed by the plantation system and began colonizing the remaining American territories, hoping to capitalize on the lucrative cultivation and trade of natural resources. Sugar was the most important crop throughout the Caribbean, although other crops such as coffee, indigo, and rice were also grown. Sugar cane was best grown on relatively flat land near coastal waters, where the soil was naturally yellow and fertile; mountainous parts of the islands were less likely to be used for cane cultivation. The coastal placement of commercial ports gave imperial states a geographic advantage to ship the crop throughout the transatlantic world. Sugar created a unique political ecology, the relationship between labor, profits, and ecological consequences, in the Caribbean. Imperial powers forcefully displaced west African peoples to cultivate sugar using slave labor. By exploiting labor and the natural world, imperial conflicts arose in the Caribbean vying for political and economic control. For example, conflicts among the English, Spanish, French, and various indigenous peoples manifested for territorial gain; regarding the region’s political ecology, these European states exploited the environment’s resources to such an extent that sugar production began to stagnate. Due to the loss of trees, needed for timber in the sugar refinement process, European imperial powers began competing and fighting over the Caribbean during the middle 17th century. Following European settlers’ entry into the Caribbean world, massive demographic changes occurred. Indigenous populations began dying at unprecedented rates due to the influx of old world diseases brought by colonists. Estimates of these population losses vary from 8.4 million to 112.5 million. This extreme diminishment of native populations cleared room for the plantation construction and lessened the conflicts between Europeans and indigenous peoples. During the colonial period, the arrival of sugar culture deeply impacted the society and economy in the Caribbean. It not only dramatically increased the ratio of slaves to free men, but it increased the average size of slave plantations. Early sugar plantations made extensive use of slaves because sugar was considered a cash crop that exhibited economies of scale in cultivation; it was most efficiently grown on large plantations with many workers. Slaves from Africa were imported and made to work on the plantations. For example, prior to 1650 more than three-quarters of the islands' population were white. In 1680, the median size of a plantation in Barbados had increased to about 60 slaves. Over the decades, the sugar plantations became expanding as the transatlantic trade continued to prosper. In 1832, the median-size plantation in Jamaica had about 150 slaves, and nearly one of every four bondsmen lived on units that had at least 250 slaves. For about 100 years, Barbados remained the richest of all the European colonies in the Caribbean. 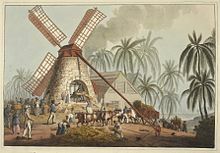 The colony's prosperity remained regionally unmatched until sugar cane production expanded in larger countries, such as Saint Domingue and Jamaica. As part of the mass sugar industry, sugar cane processing gave rise to related commodities such as rum, molasses, and falernum. The West India Interest was formed in the 1740s, when the British merchants joined with the West Indian sugar planters. The British and West Indies shared profits and needs. This organization was the first sugar-trading organization which had a large voice in Parliament. In the 1740s, Jamaica and Saint Domingue (Haiti) became the world’s main sugar producers. They increased production in Saint Domingue by using an irrigation system that French engineers built. The engineers also built reservoirs, diversion dams, levees, aqueducts, and canals. In addition, they improved their mills and used varieties of cane and grasses. In the 19th century, sugar dominated Martinique, Grenada, Jamaica, Saint Croix, Barbados, Leeward Islands, Saint Domingue, Cuba, and many other islands that had been run by French, British, or Spanish owners. During the late 19th and 20th centuries, the sugar cane industry came to dominate Puerto Rico's economy, both under the colonial rule of Spain and under the United States. After slavery, sugar plantations used a variety of forms of labour including workers imported from colonial India and Southern China working as indentured servants on European owned plantations (see coolie). In the 20th century, large-scale sugar production using wage labour continued in many parts of the region. The sugar cane industry had a negative impact in terms of environment as this industry grew in Caribbean countries. These included the destruction of forests, water pollution, and loss of fertility and erosion of soils. These problems were seen on a different scale in the Dominican Republic in the 16th century; the Lesser Antilles in the 17th century; Jamaica and Haiti in the 18th century; and Cuba and Puerto Rico in the 19th century. Although these nations have taken measures to mitigate the impacts of the sugar revolution, in some there are still traces of what the environmental historian of the Caribbean and Latin America, Reinaldo Funes Monzote, describes as a "serious deterioration" of the natural environment, with socio-economic consequences. Sugar production in the Caribbean. Sato, Tsugitaka (2014). Sugar in the Social Life of Medieval Islam. BRILL. p. 30. ISBN 9789004277526. Abbott, Elizabeth (2009) . Sugar: A Bittersweet History. London and New York: Duckworth Overlook. ISBN 978-0-7156-3878-1. Adas, Michael, ed. (2001). Agricultural and Pastoral Societies in Ancient and Classical History. Philadelphia: Temple University Press. ISBN 978-1-56639-832-9. Benitez-Rojo, Antonio (1996) . The Repeating Island. Durham: Duke University Press. ISBN 0-8223-1865-2. Bernstein, William (2009) . A Splendid Exchange: How Trade Shaped the World. London: Atlantic Books. ISBN 9781843548034. Collino, M (June 2011). High dietary fructose intake: Sweet or bitter life?. World J Diabetes. 2. pp. 77–81. PMID 21860690. Kieschnick, John (2003). The Impact of Buddhism on Chinese Material Culture. Princeton: University Press. ISBN 0-691-09676-7. Marshall, RO; Kooi, ER (April 1957). "Enzymatic conversion of D-glucose to D-fructose". Science. 125 (3249): 648–9. doi:10.1126/science.125.3249.648. PMID 13421660. Mintz, Sidney Wilfred (1986) . Sweetness and Power: The Place of Sugar in Modern History. London: Penguin. ISBN 978-0-14-009233-2. Parker, Matthew (2011). The Sugar Barons: Family, Corruption, Empire and War. London: Hutchinson. ISBN 978-0-09-192583-3. Ponting, Clive (2000). World History: A New Perspective. London: Chatto & Windus. ISBN 0-7011-6834-X. Samuel, VT (February 2011). "Fructose induced lipogenesis: from sugar to fat to insulin resistance". Trends Endocrinol Metab. 22 (2): 60–65. doi:10.1016/j.tem.2010.10.003. PMID 21067942. Sen, Tansen (2003). Buddhism, Diplomacy, and Trade: The Realignment of Sino-Indian Relations, 600–1400. Manoa: Asian Interactions and Comparisons, a joint publication of the University of Hawaii Press and the Association for Asian Studies. ISBN 0-8248-2593-4. Sharpe, Peter (1998). Sugar Cane: Past and Present. Illinois: Southern Illinois University. Archived from the original on 2008-05-18. Watts, Sheldon J (April 2001). "Yellow Fever Immunities in West Africa and the Americas in the Age of Slavery and Beyond: A Reappraisal". Journal of Social History. 34 (4): 955–967. doi:10.1353/jsh.2001.0071. Wilson, C Anne (2011) . The Book of Marmalade. Oakville, CT: David Brown Book Company. ISBN 978-1-903018-77-4. Wood, Peter H (1996) . Black Majority: Negroes in Colonial South Carolina from 1670 through the Stono Rebellion. New York: Norton. ISBN 978-0-393-31482-3. ^ Ponting 2000, p. 510. ^ "The Sugar Trade in the West Indies and Brazil Between 1492 and 1700 · University of Minnesota Libraries". www.lib.umn.edu. Retrieved 2018-05-27. ^ Molly A. Warsh. “A Political Ecology in the Early Spanish Caribbean.” The William and Mary Quarterly, vol. 71, no. 4, 2014, pp. 517–548. JSTOR, JSTOR, www.jstor.org/stable/10.5309/willmaryquar.71.4.0517. ^ Draper, Mary (2017-11-01). "Timbering and Turtling: The Maritime Hinterlands of Early Modern British Caribbean Cities". Early American Studies: An Interdisciplinary Journal. 15 (4): 769–800. doi:10.1353/eam.2017.0028. ISSN 1559-0895. ^ “The Demographic Collapse of Native Peoples of the Americas, 1492-1650.” Proceedings of the British Academy, by Linda A Newson, vol. 81, The British Academy, 1993, pp. 247–288. ^ Gerardo E. Alvarado León (September 2, 2018). "El Caribe comparte los impactos causados por industrias azucarera y ganadera" (in Spanish). El Nuevo Día. Retrieved September 4, 2018.